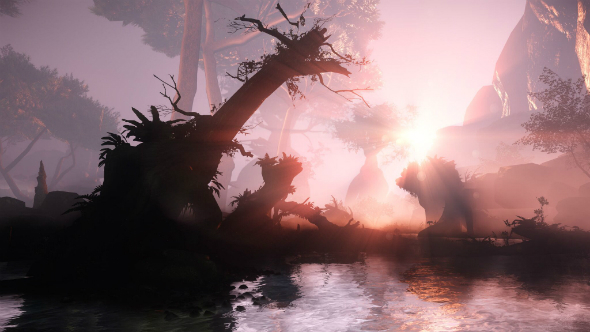 Win one of 100 Steam keys to play the first hour of beautiful narrative-puzzle game Aporia! Do games have too many words? If you think they do then Aporia: Beyond the Valley should be right up your street. It’s a first-person puzzle game that’ll be available for PC on July 19th, but there’s an hour-long demo you can play right now – all you have to do is enter our giveaway below. Aporia tells its story without any words, instead asking you to piece together its narrative by exploring non-linear environments, each filled with a mystery played out through strange nature, ancient technology, and a spirit that haunts a fog-covered forest. It’s made in CryEngine by Denmark-based studio Investigate North, which is chaired by Ole Søndberg, the producer of Wallander and The Girl With The Dragon Tattoo. Through his work, Søndberg looks to drive the emerging genre of “Nordic Noir” forward. He’s done this through film and TV but now sees an opportunity to explore it with videogames. If you want to get your start in Aporia’s world then we have 100 Steam codes that’ll grant you an hour inside the game. If you want to win one of those codes then all you need to do is enter via our widget below. Every action you complete is worth one entry into the giveaway, and the more actions you complete the more chance you’ll have of winning. We’ll also need your email address so we can send you a code upon winning – we won’t send you spam, we promise!